Little did I know that I was going to passenger train heaven when I moved to Japan. This country has an amazingly extensive train system. And it is super-efficient. The trains run on time, and leave very frequently. The Yamanote loop line, for example, which runs around central Tokyo, leaves every two minutes during rush hour. The main passenger rail company, Japan Railways (JR), operates 26,000 trains daily on average. Although you sometimes have to change trains several times on a voyage, you can get almost everywhere in Japan by train, even from one main island to another, whether by the world’s longest tunnel or an over sized bridge. The country’s investment in its passenger train infrastructure is staggering. 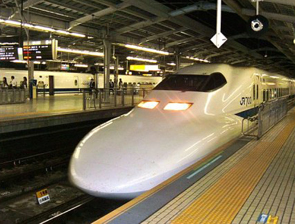 At the top of the pecking order of the Japanese train system are the “bullet trains” (shinkansen). Their network now extends to numerous cities, covering over 2,400 km. About 800,000 people take them daily. Inaugurated in 1964, the year of the Tokyo Olympics, they are sleekly aerodynamic and have stylish, spotless interiors featuring well upholstered seats and starched linen head rests. The trains are staffed by very courteous conductors, who bow on entering and leaving each car and tip their hat as they check your ticket. Also on board are elegant attendants who sell food and drinks from trolleys with a grace that is unique to this country. Conductors and attendants are impeccably dressed in smart uniforms. Shinkansen Bullet trains depart surprisingly often – every few minutes between Tokyo and Osaka. I once hesitated when I noticed that I had been booked on two connecting bullet trains with only a four minute transfer, but this turned out to be lots of time, as both trains as usual were perfectly on time. According to one source, station masters’ train schedules are calibrated in seconds, not minutes. Part of the trick for a smooth transfer is to find the marker on the platform with your train car number, wait to get on at exactly that spot – the train always stops at precisely the right place – and enter decisively as soon as descending passengers have left, because the train makes only a short stop. You then pass directly through the automatic glass doors into the hushed interior. Shinkansen Bullet trains are safe, amazingly smooth and very fast. The fastest (and most expensive) version is the Nozomi. It is considerably faster than France’s TGV. The engineering feat is that you only really sense the great speed when you run parallel to an expressway, and notice that your are overtaking the cars at a stupendous clip. The other indication of speed is the laconic announcement which appears during long straight sections of the track on the electronic notice board at the end of the car: “you are now traveling at 300 km/hour”. My most vivid experience of the speed of the bullet trains was while waiting at a platform for my train, at Kurashiki. Out of nowhere, a super-express bullet train at full speed tore past on the track right in front. I nearly jumped out of my skin! I can’t recall ever feeling a greater sensation of power from any machine: the platform shook mightily and the air compressed, as with a terrific roar the 15-car train roared by me in about two thrilling seconds. Although the bullet trains often traverse heavily populated areas, especially in the busiest corridor linking Tokyo, Kyoto, Osaka and Hiroshima, there are always appealing views of mountains and well-tended rice fields – not to mention the latest huge construction projects in Tokyo. The undeniable scenic highlight of this line, for those who are fortunate to be traveling on a day when the sky is clear, is the view lasting several minutes of Mount Fuji, a spectacular and mythic presence. Natural scenery is best appreciated on the local lines, at slower speeds. 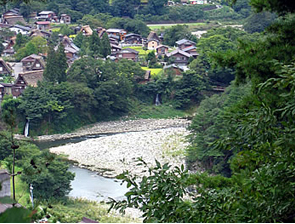 From Nagoya to the charming, isolated highland town of Takayama, the Hida train follows the Miyagawa River and offers stunning views of unspoiled rapids and mountains. 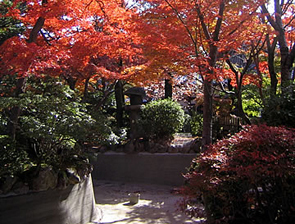 In November, the fall foliage is gorgeous. On Shikoku, the fourth main island of Japan, which is relatively undeveloped, a delightful train ride links the castle city of Kochi to the mountain temple town of Kotohira, climbing through the forests covering the central range of mountains. A surprising train experience is possible in the middle of the winter, when taking the bullet train from Tokyo to Nagano (where the 1998 Winter Olympics were held). As virtually no snow falls in Tokyo, the plain you cross heading north-west toward the Sea of Japan is snowless. Without warning, as you emerge at high speed from a long tunnel, you suddenly find yourselves in a very different place, the “snow country” of the Japan Alps. The countryside is covered in white and people are bundled up against the cold – a total contrast from what you left just minutes before. Use Hyperdia or Jorudan to find out how to go from one station to an other.